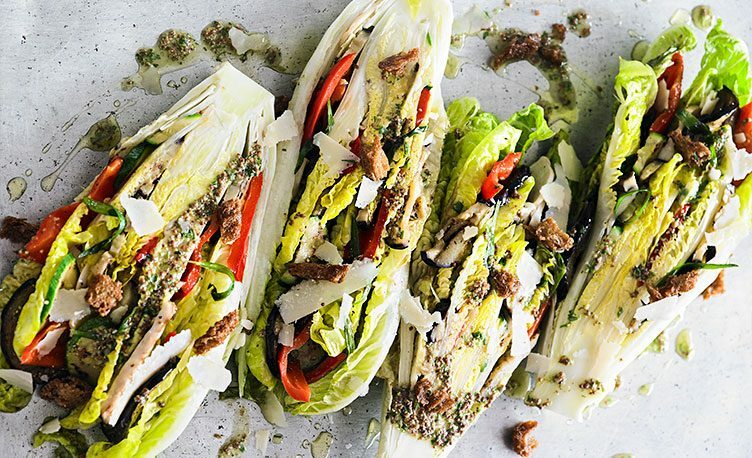 The Romaine Lettuce Vegetable Wedge is a delicious vegetarian option to cook on a BBQ. Packed with healthy goodness, this is a low calorie, tasty side to try out on your Everdure by Heston Blumenthal BBQ. For the Lettuce Wedge, slice courgette, aubergine, and king oyster mushroom approximately 0.5cm thick. Cut Romano pepper in half-length ways and remove seeds and stalk, then cut each half into 3 pieces. Lightly coat all vegetables with vegetable oil and lightly season with salt. Grill vegetables on both sides cooking until soft and caramelised. Remove the vegetables from the barbeque and place on tray. For the dressing, add all the ingredients into a deep container and emulsify using a hand blender. Use half of the dressing and the whole tarragon leaves to marinade the grilled vegetables, leave for at least an hour. Wash the romaine lettuce leaves while still attached to the root. Carefully prize open the lettuce enough to allow you to fill the gaps with the marinated vegetables, making sure to fill all gaps. Once the romaine lettuce has been filled, tie the whole lettuce using butcher’s twine. Place the lettuce in a preheated FURNACE barbeque and quickly grill the lettuces on all sides. The lettuce should be soft on the outer leaves and slightly warm. Remove from the heat and cut the strings off. To Serve, use a sharp knife to cut the lettuce in half lengthways. Finish by drizzling some of the dressing on top and sprinkle some parmesan shavings and croutons.